Bayfield is a very popular community in Conway, just off Hwy 701 and Long Avenue Extension. It's very close to Highway 22 which leads right into Restaurant Row between both beaches. Bayfield is convenient to both downtown Conway and the beach, yet it is outside the city limits and has no HOA fee. Most of the homes here were built in the early to mid-2000's, with all the upgrades such as vaulted ceilings, 2-car garage, open floorplans, screened porches, and landscaped yards on lots of a half-acre. The community was developed with plenty of green areas and mature trees maintained, which gives it a country feel even with manicured yards. Prices for these 3 and 4 bedroom homes range from around $150,000 to about $200,000. Children will attend Conway or Homewood Elementary School, Whittemore Park Middle School, and Conway High School. Taxes are low, and the living is good in these beautiful homes. If you're interested in seeing some of the available homes in Bayfield of Conway, you might have to get on a waiting list. Call us today and we'll find you the perfect place to call home. 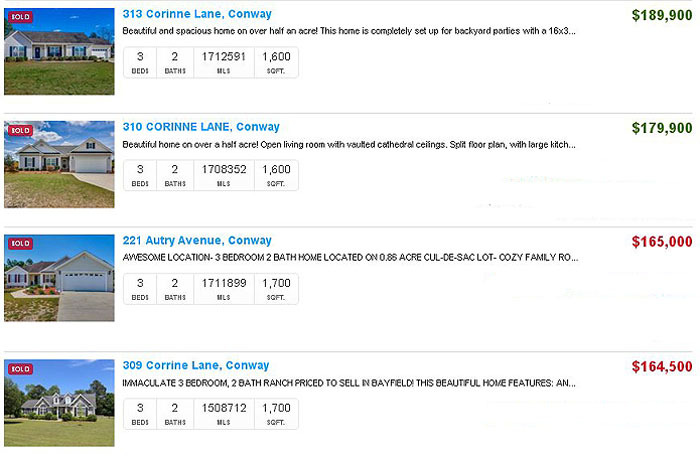 Here are some of these homes that sold in the past.